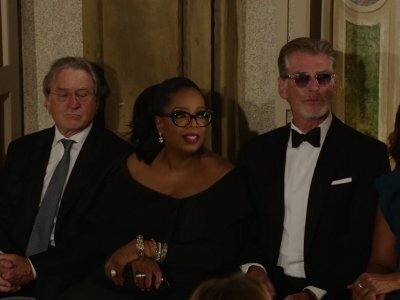 NEW YORK (AP) — A 19th-century fountain in Manhattan's Central Park provided a majestic backdrop for Ralph Lauren's star-studded 50th anniversary blowout on Friday, a festive celebration of his past and present that included a runway show and a black-tie dinner. CANNES, France (AP) — In one of the biggest sales of the Cannes Film Festival, Universal Pictures has acquired the female-led spy thriller "355," which Jessica Chastain has promoted as an antidote to male-centered action films. Universal on Saturday closed the sale of the highly touted project. Earlier this week, Chastain and co-stars Penelope Cruz, Marion Cotillard, Lupita Nyong'o and Fan Bingbing posed for photographers and pitched the film to potential buyers. CANNES, France (AP) — At last year's Cannes Film Festival, Jessica Chastain noticed the paucity of female-led action films at the movie marketplace. This year, she brought a corrective. Chastain and her co-stars on Thursday promoted plans for "355," a James Bond-like spy thriller led by female stars. Along with Chastain, the film is to star Marion Cotillard, Lupita Nyong'o, Penelope Cruz and Fan Bingbing. Is Cannes ready to adapt to the age of #MeToo? The experience of watching a few dozen or more films inside two weeks at the Cannes Film Festival can be jarring, exhilarating and exhausting — even for those who live and breathe cinema. Jessica Chastain, an actress and regular attendee of the French Riviera festival, last year reflected on her time spent on the Cannes jury shortly after they selected Ruben Ostlund's "The Square" as the Palme d'Or winner. She was both overwhelmed and disappointed. James McAvoy is in talks for 'It: Chapter Two'. The 'Filth' actor and Bill Hader are both said to have entered discussions with New Line Cinema about appearing in the sequel to the 2017 supernatural horror film, which was based on the novel of the same name by Stephen King. ALBANY, N.Y. (AP) — Sixteen actresses, including Jane Fonda, Sarah Jessica Parker, Reese Witherspoon and Natalie Portman, are urging New York Gov. Andrew Cuomo to raise the wage paid to tipped workers. The women signed onto a letter to the Democratic governor as his administration examines whether to eliminate the subminimum wage paid to restaurant servers and other workers who make tips. Jessica Chastain is in talks to star in the 'IT' sequel. The 40-year-old actress admitted in November she would love to star in Andres Muschietti's next installment to the hit 2017 reboot of Stephen King's iconic novel, but now she is in talks to play the adult-version of Beverly - who was played by Sophia Lillis in the first movie - Variety reported. Jessica Chastain stars as Molly Bloom, an Olympic ski athlete turned high-stakes gambling ring leader, in the intensely complicated, fast-paced thriller "Molly's Game." Based on an autobiography of the same name, Bloom has been convicted of leading an illegal gambling ring and is arrested by the FBI. Pleading innocence for the last two years (having been arrested previously), Bloom seeks the legal prowess of the upstanding, high-powered and well-respected Charlie Jaffey (Idris Elba). Jessica Chastain has won yet another award - for not blinking for two whole minutes. 'The Zookeeper's Wife' star completed the eye-watering challenge on Spanish chat show 'El Hormiguero' where she smashed the previous record held by 'The Leftovers' star Margaret Qualley, which stood at one minute and 14 seconds. Jessica, 40, admitted on Twitter: "It was crazy painful but it had to be done." PALM SPRINGS, Calif. (AP) — Hollywood's first awards show of the new year included a visit from Wonder Woman Gal Gadot and a promise from Jessica Chastain that "major change is coming" to how women are treated in the industry. Aaron Sorkin has a knack for timing, and not just in the obvious way. The Oscar-winning writer of "The Social Network," ''Moneyball" and other fast-talking, crackling scripts has been celebrated for his mile-a-minute wordplay. But he's also been criticized for not exactly featuring complex, strong female characters in the male-centric worlds of his stories. "Molly's Game" moves so fast it could get arrested for speeding. The directorial debut of Chatty Cathy Aaron Sorkin ("The West Wing," "The Social Network") is a word assault, using sentences like ammunition and shooting up the screen for the entirety of its running time. Sorkin uses words like John Woo uses bullets, and "Molly's Game" is his "Hard Boiled." This is not the review that will tell you to avoid a Jessica Chastain movie. Her take-no-prisoners, full-throttle performances are a pleasure in themselves, and she is at a stage in her career - enjoy it, it never lasts - where she can do no wrong. Somewhere in the next world, Joan Crawford and Bette Davis are actually agreeing on something, and it's that they really, really like Jessica Chastain. Jessica Chastain says Al Pacino "changed" her as an actress. The 40-year-old actress first worked with the 77-year-old movie legend in 2011 on the drama movie 'Wild Salome', which Pacino also directed, and Chastain has hailed the moment the pair joined forces as the turning point in her career. Kevin Spacey’s House of Cards character to be killed off? Kevin Spacey's 'House of Cards' character could be killed off amid allegations of sexual misconduct made against him. The 58-year-old actor has been accused of sexual misconduct against a string of people - including actor Anthony Rapp, who alleges Spacey made a sexual advance towards him when he was just 14-years-old - and Netflix officials are reportedly heading back to the drawing board to see how they can possibly end the sixth and final season without Spacey's involvement. TORONTO (AP) — The kind of breakthrough performance where it's immediately apparent that an actor is going to be a star for years to come is a rarity in movies. Think of Emma Stone in "Easy A" or Jessica Chastain in "The Tree of Life." TORONTO (AP) — Aaron Sorkin was sitting in a restaurant with producers Amy Pascal and Mark Gordon, ticking off the names of top Hollywood directors who might be a good fit for the script Sorkin had just finished: "Molly's Game," a drama about the so-called "poker princess" Molly Bloom. "When we got to the end, Mark and Amy said, 'But we think you should direct it,'" Sorkin recalled in an interview. "And I grabbed at the chance." NEW YORK (AP) — Louis C.K. has quietly shot a black-and-white 35mm film that he will premiere at the Toronto International Film Festival. Festival organizers on Tuesday announced additions to Toronto's lineup. C.K. 's film is called "I Love You, Daddy" and will be unveiled at the early September festival. It stars C.K. as a TV producer and writer whose daughter is played by Chloe Grace Moretz. Jessica Chastain has joked she will make James McAvoy cry "so hard" on the set of 'X-Men: Dark Phoenix'. The flame-haired actress stars alongside James in the new superhero movie and while she's remained tight-lipped about her character's identity, Jessica has suggested she will play an important, villainous role. Jessica Chastain has got married. The 40-year-old actress and her long-term partner, Gian Luca Passi de Preposulo, tied the knot in Treviso, Italy, on Saturday (06.10.17) in the family chapel of the groom's luxury estate, Villa Tiepolo Passi, Italian news outlets have revealed. And a source told E! News: "Italy was a place where they always wanted to get married. Jessica Chastain has blasted the "disturbing" representation of women in film. The 40-year-old actress was a member of the jury at the 2017 Cannes Film Festival and admitted she was shocked at how few "authentic" women were portrayed in the movies she watched. CANNES, France (AP) — The Cannes Film Festival threw a star-studded celebration Tuesday for its 70th anniversary, drawing mobs of celebrities and a dozen former Palme d'Or winners to commemorate the illustrious French Riviera festival's birthday. TULSA, Okla. (AP) — Samantha Isler's life is one of maintaining a balance in all things. Learning about this young woman's movie-making might make you think "high-profile and Hollywood" — but she's all about low-profile and Tulsa. Her latest movie, "Dig Two Graves," is opening in theaters — a couple of weeks before she graduates from Bishop Kelley High School. Jessica Chastain can handle her grueling work schedule because she's able to "sleep anywhere". The 40-year-old actress plays the lead role of political lobbyist Elizabeth Sloane in the upcoming thriller 'Miss Sloane' and the character takes drugs to stay awake so that she can work longer hours, but Chastain admits she'd never resort to such measures because she can fall into a "deep" and restorative slumber at a moment's notice.